You may be pleasantly delighted to see your newborn’s head full of hair or a little dejected if he is scantily haired. However, what you observe in the beginning may not be your baby’s permanent hair type, as it would gradually shed and grow again. As a new mommy, it is essential to understand the reasons for hair fall in your baby, so that you know when to relax and when to hit the panic button. 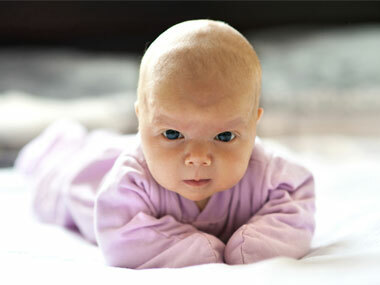 It is normal for newborns to lose hair in the initial six months of their life , which stops gradually after that period. Drop in hormone levels: Before birth, a baby receives high levels of hormones (mostly estrogen) from your body. However, after birth, there is a major drop in the hormone levels, which results in shedding a lot of the hair your baby was born with, particularly on top of his head, and even on both sides [2, 6, 19]. Resting phase: The resting or telogen phase lasting for approximately three months, is often responsible for limiting hair growth in your infant during that period [1, 3, 7]. Birth trauma, fever or any autoimmune disorder may, however, prolong the resting phase. The little hair remaining would fall off in the new cycle when they are pushed out by the new ones that grow. His hair might have a patchy look at first, getting thicker and stronger with time . Sleeping on the back: Since parents put their newborns to sleep on their back to minimize the risk of SIDS (Sudden Infant Death Syndrome), most babies tend to loose patches of hair in the back of their head due to the almost constant rubbing against the crib or bed [8, 16]. Friction against a surface: Babies also have a habit of rubbing their head on a particular surface like a mattress or car seat, resulting in bald patches which go away once they are able to sit upright [6,10]. Change his sleeping posture regularly to prevent only one part of his head from being rubbed against the surface of the crib . Ensure more tummy time whenever he is awake to minimize hair loss alongside the flattening of the head . If you have a girl, avoid tying tight pigtails or even putting an elastic headband as it might result in hair breakage [2,9]. While applying shampoo, which should not be more than twice a week for babies less than six months of age, massage it gently into his scalp as a harsh hand may put a greater stress on the hair follicles . Comb your newborn’s scalp using a soft-bristled brush to make way for strong, healthy hair . If your baby is losing hair even after six months of age, along with other symptoms like loss of appetite, bring it to the notice of your doctor at once as this could indicate an underlying condition, needing treatment [1, 5]. Cradle crap which causes the scalp to become dry, and flaky (similar to dandruff) that may even result in hair fall in the affected area [11, 12]. Alopecia areata where there is a sudden loss of clumps of hair, resulting in oval or round bald patches . Trichotillomania, a condition where one tends to pull the hair not only of their scalp but also eyebrows and eyelashes. Though it mostly appears in toddlers or older kids, it is essential to supervise an infant if he is seen to indulge in pulling at his hair quite often [1, 14]. Fungal infections like ringworm or tinea capitis that is more common in kids above two but might even occur in infants, leading to black spots, and flaking in the area where the hair has fallen [1, 15]. Atopic eczema, which occurs on the scalp or any other part of the body, might result in hair loss since it causes itchiness in the affected area . Hypothyroidism and hypopituitarism, leading to hair loss [1,9]. Deficiency in nutrients like calcium and vitamin D may also be one of the reasons for hair loss [6,18].